When you think of summer, you usually think of beaches, ice cream, sunglasses, good weather, tanning, leisure, … You think of everything that makes you happy. Thus, naturally, the least thing you have in mind during summer is studying. Lets have a look how to effectively study during summer and how to make it a bit more bearable. In general, studying in summer does not differ too much from studying during any other time in the year. Not in theory, at least. 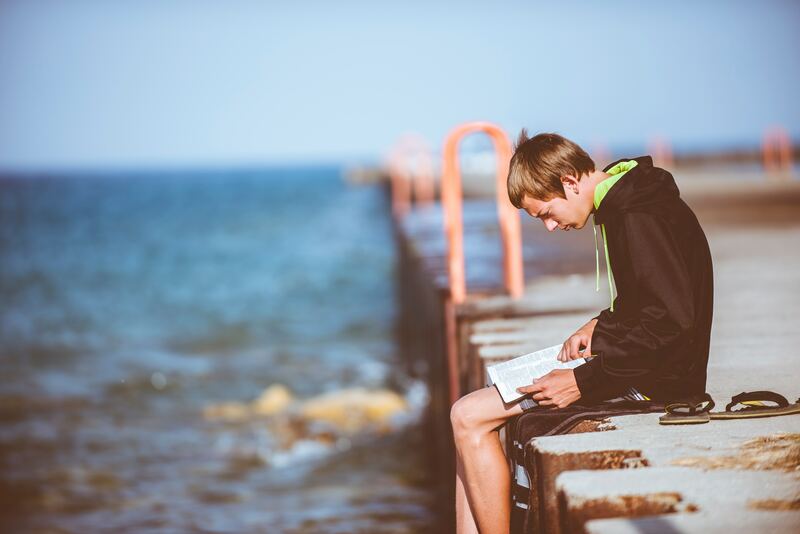 There are a few things, that can be especially important when studying during the summer. Lets have a look at how to make this a bit more bearable for you. Some of these suggestions are especially valuable during summer. Others are important for every study session, but need some more emphasis during the hot months. The first thing mentioned above that makes studying in summer so tedious is the heat. June, July, August, September – the temperatures during these months is usually quite high. This takes its toll on us. Especially when we have to concentrate, this becomes a nuisance. To be productive and thus study or write your paper successfully, you have to actively fight the heat! Using a fan or AC is one way to do it. Cooling down the room you are working in to a temperature you feel comfortable in is crucial. However, be careful when doing so. Make sure that your fan is not blowing directly into your face or ears. The last thing you’d want in summer, apart from studying, is a cold. Thus, also don’t overdo it on the AC. Studying in Antarctic cold is not very helpful either. Also, before storming out into the heat after a study session, take your time to let the room and even more importantly your body come back to a temperature that is not a stark contrast to the high ones outside. Another way to circumvent the high temperatures is to study at night. Usually, summer nights are, while still warm, a lot cooler than the hot summer days. You are able to open a window without having to fear your quite moderate room to heat up, which also provides you with some fresh air. The latter is also known to boost your concentration, so with that and a cooling breeze it’s a win-win. Also: ice cream! When following our next suggestion, make sure to treat yourself to a cone or popsicle. This is important in all your study sessions: take your breaks. Especially in summer’s heat, it is even more important. Make sure you don’t overheat, no only from external heat, but also from intellectual work. Take those breaks to drink, often and much. It’s also the perfect time to grab some ice cream! Rewarding yourself for successful studying or a long session of writing should always be a part of your studying routine. Summer study sessions are no exception to that rule. Just that the rewards may vary a bit. Some nice ice cream, a juicy slice of watermelon, a trip to the beach – reward yourself with what you are deprived of due to the tedious studying. Meet up with friends that may suffer from the same or were lucky enough to fully enjoy their summer. With a good study plan, it should be no problem for your to squeeze in the things that make summer fun in between your study sessions! In most cases, you have a specific spot in your house or room that you feel most comfortable studying in. It’s the place you set up for yourself and it provides you with everything you need to study. But nothing speaks against pretending that you are someplace else! If you don’t want to leave the comforts of your home, you can at least mimic another environment. And it comes without the disadvantages of grass stains, noisy people, or other unexpected distractions. For example, coffee shops and cafés are said to boost your creativity. So why not pretend that, instead of at your desk, you are sitting in a cozy booth in a calm yet lively coffee house? If you are missing out on the nice weather outside, you can bring your studying into nature as well. With different sounds of nature, for example, you can bring your studying into the meadows, a forest or atop of a mountain without disturbing mosquitoes or wind. Or what about a study session at the beach without getting sand everywhere. If you don’t want to study somewhere else, you can also change the weather to your liking. When the sun outside is not doing it for you, tune in some rain sounds or even a thunderstorm. Instead of pretending to be anywhere but your study room, you could take the study material, your paper, or whatever you are working and researching on out. There are several places that qualify for a great studying environment. Of course you can visit them no matter the season, but there are some advantages of certain places during summer. Nature, for example. It’s warm, beautiful and lively out. Most of the time, the wind is rather soft and provides a cool breeze without scattering your papers all about. Plus, it enables you to go to the places you would visit for leisure anyway without feeling guilty. The beach or shores of a lake, for example. Just take your papers or laptop out with you, work for a bit, and then reward yourself with some relaxing time or a swim. Parks work nicely as well, however you should be aware that these places are, of course, frequented by others as well. Forests, however, are not recommended study places due to ticks and mosquitoes. Libraries and study halls have one big advantage in summer: in most cases they have an ac. This means you do not need to take care of cooling down your room yourself, you can leave it to the respective facility. Plus, these places are especially low frequented by other people during warm and nice weather. ‹ Does Music Have Healing Powers I Don’t Know About?